I have CDs to copy folders. I'm not worried about my tax documents. I'd feel safer just eliminating them when we wipe the C drive. As long as you're sure ~ there's no going back! My favorite pictures are on an external hard drive so I'm fine with that. Excellent! Make sure you unhook this when asked during the format/reinstall process. I can copy documents on CDs. Reinstalling Firefox is fine no bookmarks. 2) Do not backup any executable files or any windows files. These include .exe's, .scr, .com, .pif etc... as they may contain traces of malware. Also, .html or .htm files that are webpages should also be avoided. I'm concerned that when I copy files to the CDs I will be copying a virus along with the info I'm saving. Is this a concern? No. You're copying music, documents and pictures, they are very unlikely to be infected. Remants are all that is left, I'm sure. The damage done to your OS by the malware is what we're aiming to correct here by reinstalling it. I will be backing up everything on Wednesday and will let you know when I have finished. There might be a complication: My D drive (Recovery) has only 2.05GB free of 16.6GB, is this a problem? My C drive has 636 GB free of 681 GB. No. Drive D is the Recovery Partition on the same hard drive. What we are doing is a Factory Reset: Factory Reset removes all partitions (except the RecoveryPartition) reformats the entire rest of the hard drive, reinstalls the original operating system, and reinstalls all the original hardware drivers and software. 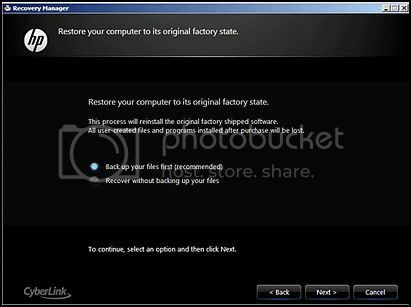 The Factory Reset option returns all of the software to the condition it was in at the time of purchase. All user changes or additions are removed. When we do this, your whole Drive C will be formatted. Which is 3.16 GB on disk? I'm ready to wipe my C drive. I have made a copy (4 CDs worth) my operating system. I have copied all my docs and pictures. Not to concerned about bookmarks. I'll post back instructions soon as I can. Sorry for the delay, work took my time. No rush, work comes first. 3.16GB is the amount of space I need to back up my personal files, no big deal. I await your instructions. Let's do this. You'll have a chance to backup as I showed you before. Please read thru everything before you start. You may want to print these instructions as you won't have access to here while you're doing this. 2. Disconnect all connected devices and cables such as Personal Media Drives, USB drives, printers, and faxes. Remove media from internal drives, and remove any recently added internal hardware. Do not disconnect the monitor, keyboard, mouse, or power cord . 4. 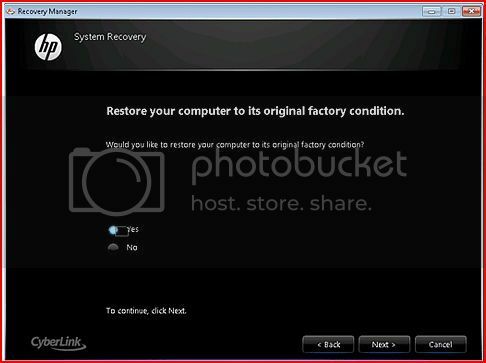 Click the Start orb ~> All Programs ~> Recovery Manager , and then click Recovery Manager again. If you are prompted for an Administrator password or confirmation, type the password or provide confirmation. If a User Account Control window asks if you want to allow the program to make changes to the computer, click Yes . 5. Under I need help immediately , click System Recovery . 6. 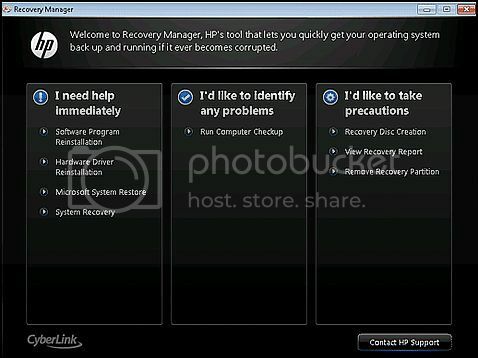 The Recovery Manager asks if you want to restore the computer to its original factory shipped condition. Click Yes , and then click Next . 7. The computer restarts. If the recovery partition on the hard disk drive is functioning correctly, the Recovery Manager window appears. NOTE:If the recovery partition on the hard disk drive is not functioning correctly, a set of recovery discs is needed to run a system recovery. If this does not work correctly, please stop here and let me know. We'll make alternate plans. 8. Click System Recovery . • If you have already backed up personal files or you do not want to back up personal files, select Recover without backing up your files , and then click Next . Continue with Step 10 below. Select Back up your files first (recommended) , and then click Next . Select the file types to back up, and then click Next . Recovery Manager scans the computer for storage devices. Select the storage device to save the backup, and then click Next . NOTE:If you selected a CD or DVD drive, the computer prompts you to insert a blank disc. 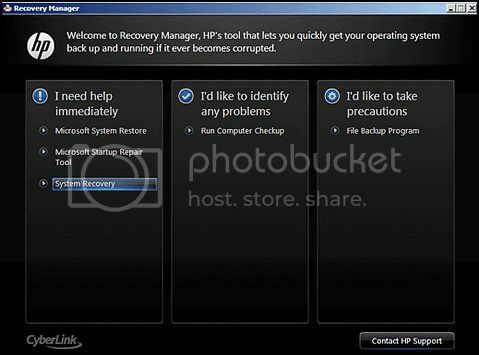 When Recovery Manager is finished backing up files, remove the backup disc or storage device, and then click Next to continue with the recovery process. NOTE: If the backup process fails, make sure the capacity of the storage device is large enough to store the files, or try de-selecting some file types to reduce the amount of files that are copied. Other reasons for failed backups might be caused by file corruption. 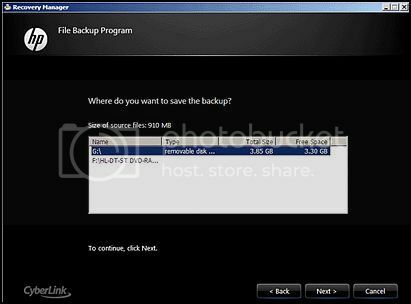 In some cases, it might not be possible to save files using this backup method. 10. Click OK in the warning that appears. 11. After the system recovery is complete, click Finish to restart the computer. Complete the setup screens and wait until the computer finishes the setup. 12. Once the setup is complete, turn off the computer, reconnect all devices and cables, and then turn on the computer. 13. Before using the computer, Update your Computer. Go to Windows Update and check for and install any recommended Updates. If any important updates are found, click the link to view available updates. In the list of updates, select Service Pack for Microsoft Windows (KB976932), and then click OK. Install this first then go back after it's complete and do the rest if there are any. Reinstall any other security software that was installed before the system recovery: Norton, WinPatrol, Malwarebytes Free version, etc. 14. Reinstall any software programs that were added after purchasing the computer, as well as any files that were backed up. I will read and print before proceeding. I will start system recovery on Sunday. Will I need to disconnect my Wi-Fi? Will we be able to communicate if I have trouble doing this? Edited by 1324, 18 January 2014 - 06:59 PM. I edited post #170. I added 2 questions. Will I need to disconnect my Wi-Fi? Will we be able to communicate if I have trouble doing this? No. Your Wi-Fi will be fine, you do not need to do anything with it. As for communication do you still have your iPad? You can use that if need, but I think you'll do ok! Do expect atleast 4 hours to completion. Just so you don't worry it's taking so long. Rich? Please don't edit your posts. It makes it confusing especially if we're posting at the same time and I'm answering the original Better for you to make another post. I made it to step 13 with no problems. I have 134 Windows Updates and 7 optional updates but no update that is Service Pack for Microsoft Windows (KB976932). The "highest" KB I found was Service Pack 2 (KB973688). Please advise. We're almost done!!!!!! I made it to step 13 with no problems. Excellent work! I told you you could do it! Great job! I have 134 Windows Updates and 7 optional updates but no update that is Service Pack for Microsoft Windows (KB976932). The "highest" KB I found was Service Pack 2 (KB973688). Please advise. If what we're looking for is installed, you should see under Windows Edition Windows 7 Home Premium, with Service Pack 1 under it. Does it say Service Pack 1, Rich? If it does, continue with the Updates. If not, please let us know ~ Thank you! Yes, it says Service pack 1 under Windows Home Premium. I will proceed downloading 134 updates.